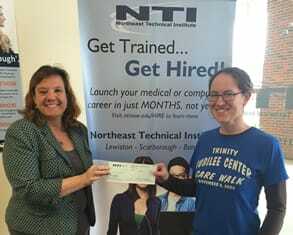 March 30, 2016 – Lewiston, Maine: Following the success of Northeast Technical Institute’s Open House & Job Fair earlier this month, NTI recently donated to the Lewiston community through the local food bank, the Trinity Jubilee Center. The $1000.00 donation from NTI to the Trinity Jubilee Center will help Lewiston residents in need, by providing additional funding for balanced meals in Trinity’s soup kitchen and food pantry, as well as contributing to their resource center and day shelter programs. Located in Lewiston, Maine, the Trinity Jubilee Center is a non-religious organization dedicated to advocacy for those in need in our community. Every year the Center helps thousands of hungry people by providing not only hot meals and healthy groceries, but help addressing the reasons they are hungry, through helping people find jobs and housing and negotiate the challenges in their lives. Everyone is welcome. http://www.trinityjubileecenter.org.